Let’s get right to the point…time is a valuable asset. This is one of the most important aspects to consider when creating content for a landing page. Your visitor ended up on this page with a particular purpose or goal in mind, and if it doesn’t have what they’re looking for right away, it’s likely they’ll leave and never come back. It's a common mistake that we see B2B companies make all the time. And for many of them, it starts with the copy. In this article we will address the proper techniques that you can use to ensure your landing page entices your readers and prospects to take action. And most importantly, we're going to show you how to create successful copy that will drive more conversions. Use the correct language to give the reader what they expect. For example, if you’re offering an e-book on business blogging, make sure the phrase "blogging” actually shows up on your landing page. Choose some key terms before you start developing your content and be mindful to include them at various stages within the copy. Before going live, ask yourself if your landing page passes the "blink test", meaning does your landing page capture your attention in less than 3 seconds. Because that's all you have before they lose interest and leave. You want to be sure that you're keeping the focus on the offer - removing navigation, adding bullet points, and an image all help. Why can’t they live without it (or why do they need it)? What do they need to do to get it? A landing page can be broken down into 5 main sections and there are several important factors to consider when creating content for each of these. Although every page is different, these points can be used as a guide when creating your own landing pages for the fantastic offers you have. Likely this is the first thing that a reader will see so choose your words wisely. Use this space to tell the reader exactly what they will gain from your offer. Saying something like “You will learn..” or “You will get..” is straight to the point. If they clicked on a link offering them A Guide to Social Media, for example, they expect to see the words “social media” immediately. Capture leads by giving the reader what they are looking for and include these keywords in the headline. While every offer is different there are some aspects to writing dynamic copy that will persuade a reader to take you up on your offer. 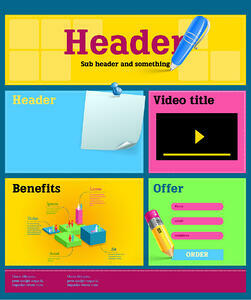 This section of the landing page is used to explain the features and benefits of your offer. Get right to the point and call these out using action words and relevant keywords. Speak directly; don’t make the reader think too much about what they will gain from your offer or you risk losing this potential lead. “Increased web traffic” sounds more direct, while “More people will see your page in search engine results,” forces the reader to make the connection between better SEO optimization and more web traffic. Whenever you have the chance to use ‘you’, go for it. This will make it easier for the readers to visualize themselves in the instance you are talking about. For example, “You will see immediate results” sounds much more personal then “Users who download see immediate results”. This may seem obvious, but edit your landing page before you publish it. Besides spelling and grammar, make sure your writing is consistent. If you said you had a 3-Step Guide, don’t refer to it as a Three-Step Guide later on. See the difference? Typos and errors make your offer seem less credible and decrease the likelihood of download. You are probably asking readers to give you some information about themselves, whether it be an email address or something more, and you need them to trust you so they feel comfortable sharing this. To allow for an ease of readability consider including a few bulleted points on your landing page. Put the most important points about your offer in bullets at the beginning of a paragraph or use them at the end to sum up the benefits. Although getting your offer should be easy, you might include a numbered list of steps to emphasize just how easy it is. For example, “1. Enter Email Address, 2. Click Download”. Formatting your content by breaking it up in this way will help you direct the reader’s eye around the page. You want the call-to-action to be obvious. This brings us back to our main point about time being important. The chances of download are greatly reduced if the reader has to search for the download button. Make sure this text includes an action verb, like “Download Now” or “Click Here”. After all, you are calling your reader to action, so make sure you tell them exactly what to do! Make it concise and to the point and make it stand out! A lot of times this last point seems to fall to the responsibility of design team, but it is also your action based, compelling text that will draw a reader in. Images are appealing, that’s a no-brainer. So make sure to include an image of your offer with a caption underneath that sells it. Maybe an image showing the charts included in the templates you are offering with a testimonial caption underneath. Keep it short. Something like “ ‘I’ve never felt so organized,’ John Smith, CEO at Smith Investments.” would increase the credibility if read but does not state anything to important. Image captions are usually the smallest font on the page so the chance of this copy being passed over without a glance is the greatest of all. This is what will pop up after your reader clicks on your call-to-action. Not only is this a polite way to show your appreciation but it can also be an opportunity to show them what else you have to offer. Consider what someone who downloaded this offer might also be interested in and include a link to other landing page or relevant content. Track your landing page to see how effective your campaign was. How much traffic did you offer generate? How many people that came to your landing page went through with the call-to-action? Where did this traffic originate? These are important things to understand as you move forward and create more offers. Compile an email list of people that downloaded this offer and be in touch. You may want feedback or you may have another way you can help them. Whatever it is, this is a great way to prevent leads from growing cold and encourage conversation.